Kinda expensive but they are yummy. A little pricey for me but they are delicious and a great on the go snack! Love the resealable bag! I absolutly love these!! I could sit and eat the whole bag! But the only downside is, is that they are a bit pricey. I tried these and though they were good- they seemed a little sweeter than I would expect. I thought they were also a bit on the expensive side. I received a free package of these in the mail from the company during a giveaway. They were so delicious that I wanted more. I'm hungry just thinking about them. 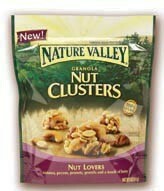 I love the nut lovers clusters! Unless you can catch it on sale, the price is a little high. I got a free sample of the clusters and they tasted great!! Since I have tried a "free" sample of these nut clusters, I have purchased 5 bags already in just a month. I usually do not purchase items like these unless they are so good I have to have. I have used coupons, plus they seem to be cheaper at Walmart and Target so far. The first bag only lasted one sitting. But now I put in small baggies (snack size), and take them with me. These cluster are just devine, they have the combined tastes of sweet and salty it is just DELICIOUS. Bag is resealable too. GREAT item.